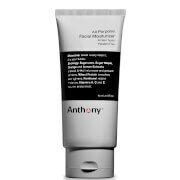 Remove dead surface skin cells and dirt with the Facial Scrub from Anthony. The unique formula is free from harsh grit and contains Bora Bora white sand, which gently exfoliates dead skin, dirt and grime that accumulates on the skin’s surface. Ideal for even the most sensitive skin, the scrub is infused with Aloe Vera, Algae and Chamomile which work the soothe skin, leaving it feeling refreshed. Also works to lift beard hairs before shaving, helping to avoid ingrown hairs and razor burn. Massage all over face in a circular motion. Use 2-3 times a week, or as needed.